How to Reduce your Plastic Usage! Here is a Quick List of some easy changes you can make to reduce your plastic usage! Stop using plastic straws, even in restaurants. If a straw is a must, purchase a reusable stainless steel one. Use reusable produce and shopping bags. A single plastic bag can take 1,000 years to degrade. Purchase or make your own reusable produce bag and be sure to wash them often! Give up chewing gum. Gum is made of a synthetic rubber, aka plastic. Yuck. Buy products sold in cardboard boxes or glass instead of plastic, which can be easily recycled. Reuse containers or invest in Tupperware for storing leftovers to avoid cling film/ freezer bags/ zip lock bags. Stop buying bottled beverages! Use a reusable water bottle. You’ll cut down plastic, and reap the health benefits! Bring your own thermos or keep mug for hot beverages, even when ordering from a coffee shop. Bring your own container for take-out or your restaurant doggy-bag since many restaurants use plastic containers and styrofoam. Use matches instead of disposable plastic lighters or invest in a refillable metal lighter. Avoid buying frozen foods because their packaging is mostly plastic. Even those that appear to be cardboard are coated in a thin layer of plastic. Plus you'll be eating fewer processed foods! Don't use plastic cutlery at home and be sure to request restaurants do not pack them in your take-out box. 450 billion disposable nappies are used each year world wide, which contribute nearly 77 million tonnes of solid waste to landfills, and a disposable nappies takes at least 500 years to degrade. Switch to cloth nappies to reduce your baby's carbon footprint and save money! Make freshly squeezed juice or eat fruit instead of buying juice in plastic bottles. It's healthier and better for the environment. Make your own cleaning products that will be less toxic and eliminate the need for multiple plastic bottles of cleaner. Baking soda and Vinegar recipes can be found with a quick google. Pack your lunch in reusable containers and bags. Also, opt for fresh fruits and veggies and bulk items instead of products that come in single serving cups. Buy loose fruit and veggies - nature has already wrapped them perfectly! Avoid Microplastics! These tiny pieces of plastic are commonly added to products like face scrub and toothpaste that are intended to be exfoliators, but they end up in the ocean. There are many biodegradable alternatives, so avoid items with “polypropylene” or “polyethylene” on the ingredients list. Switch to using bars of soap, and consider trying bars of shampoo and conditioner to eliminate bottles. LUSH make wonderful products that don’t leave your skin and hair dry! By making a few small changes we can all make a BIG difference. Q: What species of seals do we have in Ireland? A: While there are 33 species of seal in the world, we only get two in Ireland- the Common (Harbour) seal and the Grey seal. Despite the misleading name, the Grey seal is the most commonly seen seal in Ireland. There are many differences between them, but grey seals are bigger and have longer snouts than common seals. Grey seals are also the ones with the white furry coats when they are pups! If you'd like more detail, visit our dedicated seal facts page here, or even better, come visit our centre in Wexford and see for yourself! Q: Where do the seals in the centre come from and why are they here? A: All of the seals in the centre were found by people like you! 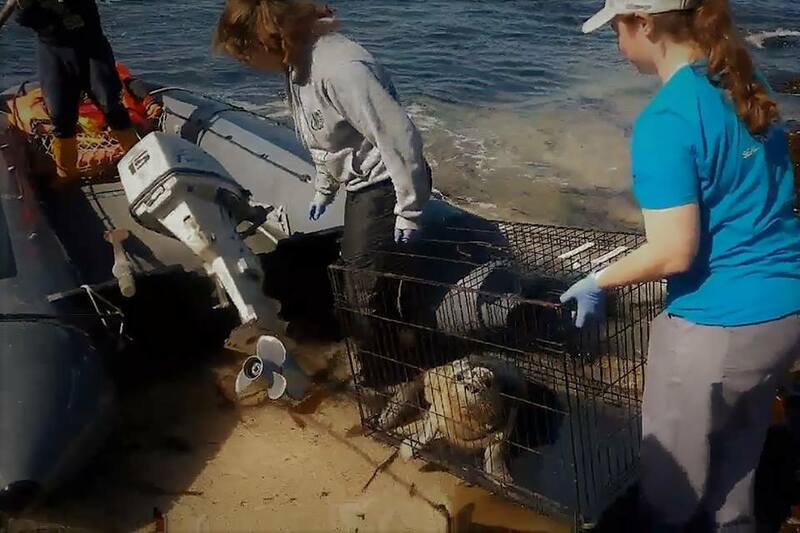 These people reached out to us because they thought the seal needed help and we came out to rescue them. All of the seals we take in were either sick, injured or orphaned. We do not take in any seals that are fine on their own because it is always better for them to be in the ocean! Q: How long can they hold their breath? A: Gray seals can hold their breath for over an hour, whereas Common seals can hold their breath for about a half hour. This is really helpful for diving under the water to find fish to eat! Q: How long can they stay out of the water? A: A seal can live out of the water indefinitely, as long as it had enough food to eat and was at a nice temperature. Unlike dolphins and whales, seals are able to support their own weight on the land. It is perfectly normal for them to come up onto the beach for long periods of time! Q: What do seals eat? A: Seals primarily eat fish, but will sometimes eat squid and crabs if they can find them. While in our care, we feed them a steady supply of herring in order to make sure they are getting all of the nutrients that they need while helping them to put on blubber quickly. Q: What are the threats to seals in the wild? A: The primary threat to seals is humans! Between pollution of the ocean from garbage and oil spills, as well as some fishing and boating practices, humans have caused a lot of trouble for seals. Another big issue is people scaring them while they are on the land, which can cause great amounts of stress. If you see seals on the beach, stay a safe distance away and call us if you think it may need some help. A few weeks ago we wrote a blog post about a typical seal rescue, and we spoke about our Seal Rescue Network. Since then we have gotten a lot of interest, so we’ve decided to write a post to explain more about it. Our Seal Rescue Network encompasses ordinary people who have attended some basic seal rescue training with us. This means that if we are informed about a seal in distress near where they live, we will contact them and ask them to help us. The Rescue Network volunteers can help us in many ways, from just observing the seal or keeping it safe while help comes, to collecting the seal and transporting it either to our centre or to another volunteer who can drive then it to our centre. We have regular seal rescue training sessions around the country, and we currently have a volunteer network of over 500 people. Due to the unpredictable nature of seal rescues these people may never get called to help, or they could be called very often! The more volunteers we have, the less distance people have to travel to check on a seal, and the faster we can rescue them. If everyone helps out, it makes less work overall! So what can you expect from a seal rescue training session? Well, first you’ll learn some of the basic facts about the seals we have in Ireland, and some of the common reasons that a seal might need our help (such as entangled in a net). Next, you’ll learn some key identifying points to help discover more about the seals condition, and whether or not it needs our help. You will also learn the safe and correct way to restrain a seal, so that neither you nor the seal is harmed, and the best way to transport it safely to our centre. You can also receive some other benefits like being invited to private releases etc. If you are interested in joining the network, our Facebook page is the best place to check and see if there is a training session coming up near you soon! A group of newly trained rescue network volunteers at an event in Waterford in April 2018. Do you follow us on social media? Seal Rescue Ireland is on Facebook, Instagram, Twitter and Snapchat. Following us on social media is the best way to stay up to date with any events or seal updates we have! TripAdvisor: if you have visited our centre, please leave us a review! We post this every year, but it's just so, so important that we are sharing it again this year. We are now in the midst of the summer season when Common seals give birth to their pups - June, July & August. With the recent hot weather we think many people will be out on beaches, and we ask you to please keep your eye out for seal pups in distress. Human activity by means of boat traffic and water sports, as well as people and dogs on beaches can sometimes frighten away nursing mothers and inadvertently lead to pups being injured or orphaned. - Do not disturb them – observe from a distance. - Keep dogs and children away. - Contact us for advice! Though we can provide care for these little orphans - nothing compares to a mother caring for and raising her pup so it is extremely important to prevent the circumstances where pups end up needing to be rescued, and by sharing we can all help! When people come visit our centre in Wexford, they often ask us what exactly goes on during a seal rescue mission. Seal Rescue Ireland is the only dedicated seal rescue centre in Ireland. A rescue call can come in at any time, from anywhere, and it is impossible to predict so we always have to be prepared. We are especially busy during the seal pupping seasons (June-August for common seals and October-January for grey seals) but calls come in all year. Are there any obvious injuries or wounds? Does it seem very thin, can you see bones through the skin? Are their eyes dry, or are there big wet patches around them? Is it very small, can you see another seal nearby, or in the water? Questions like these can help us decide if the seal is in need of our help, just relaxing on the beach or waiting for its mother to come back. Seals often relax on land, and mothers can leave baby seals on land for a while as they go hunting. Touching a baby seal can frighten the mother away and cause it to be abandoned, so it’s really important we are sure the seal is in need of our help before we intervene. We will try get the caller to send us photographs, as visual aids are really helpful. If we think the seal needs our help, or might need our help, we will usually contact a member of our Seal Rescue Network. These are ordinary people around the country who have undergone a rescue training session with us and live nearby to the seals location. They can often get to the seal far faster than us and help us decide for sure if the seal needs help, and if so, they are trained to safely restrain the seal in a way that doesn’t put either them or the seal in danger. Once the seal has been picked up, depending on the distance to our centre in Wexford, we could have a number of drivers who will rendezvous across the country and pass the seal to each other, usually in some kind of dog crate with towels. Seals don’t actually need to be in water to survive, and although they prefer the sea they can survive perfectly fine for days and even weeks without being in the water. Once the seal arrives at our centre, our Animal Care Manager and volunteers will perform a number of checks. If the seal has some open wounds or serious injuries we will take it to our local vet for specialist care. Otherwise, the first thing we will do is check the weight of the seal, this can tell us many things such as the age, if the seal is underweight, and it also allows us to keep track of it and see if the seal gains any weight in the coming days. Other things we will do are try and check if it’s a male or female, give it some electrolytes for energy (we sometimes jokingly refer to this mixture as “Seal Lucozade”!) and we will tube feed it a blended mixture of special animal milk and fish. If the seal is very poorly or underweight, it is not unusual for the volunteers to undertake what we call “midnight feeds”, which involves feeding the seal regularly every few hours, including in the middle of the night! For the first few days we usually keep the seal in an intensive care unit with lots of warm towels and a heat mat, and tube feed it regularly to help it get much-needed nourishment. This helps the seal relax and get better, just like people do in hospital! Once the seal has started to show signs of improvement, we will move them to a kennel, where they can enjoy a nice bath and continue to relax. Once the seal has moved to the kennels, we will give it a name. Sometimes this name could be from the volunteer who was in charge of its primary care, or it could be from the person who found it and called it in to us. Usually our seal names will have a theme, such as nautical or superheroes, which helps make it a little more fun! If you are interested in helping rescue a seal, we have regular training sessions around the country that have a small fee to attend. Please keep an eye on our Facebook page to see if there is a training event near you soon. If you love seals but can’t commit to a rescue, you can adopt a seal and help pay towards its care, or you can come visit our rescue centre in Wexford which is open daily. Many people who visit our rescue centre wonder why the seals have come into our care. One of the most common reasons why a seal needs to be rescued is because they have become caught in a net or some kind of plastic waste. 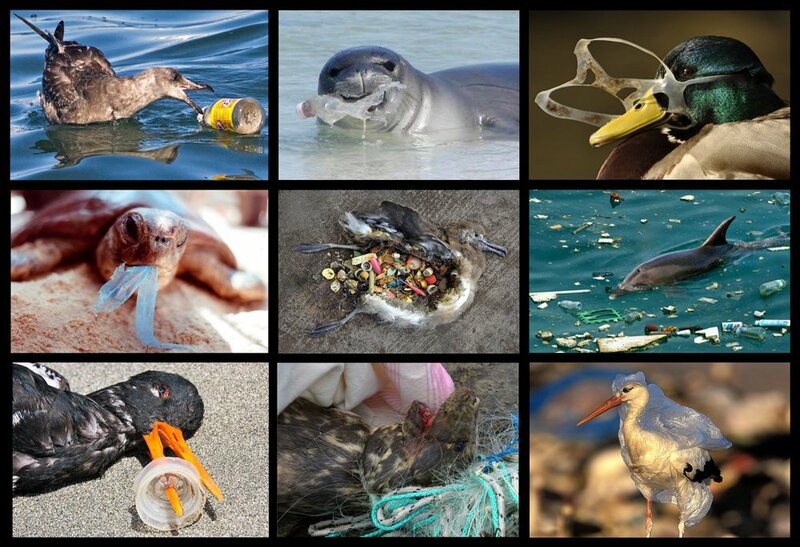 Every year more than 100,000 marine creatures die from plastic entanglement in marine debris. Researchers have estimated that by 2050 there could be more plastic in the sea than fish. Unfortunately this problem is only getting worse. In the past decade alone, fatal entanglements and consumption of marine debris by marine animals has increased by 40%. This has been evident to us as we have had numerous seals which came in with varying degrees of entanglement. Entanglement can harm seals in many ways. What usually happens is a young seal gets trapped in some form of plastic, often around the neck. When the seal continues to grow far bigger, the plastic does not and it gradually digs into the seal. This can cause a slow and painful death as their wounds become infected. Larger debris like nets can also prevent them from swimming or hunting properly, leading them to starve. This is why speed is imperative when dealing with an entanglement case; the sooner we get the plastic off the animal, the least amount of damage is done. 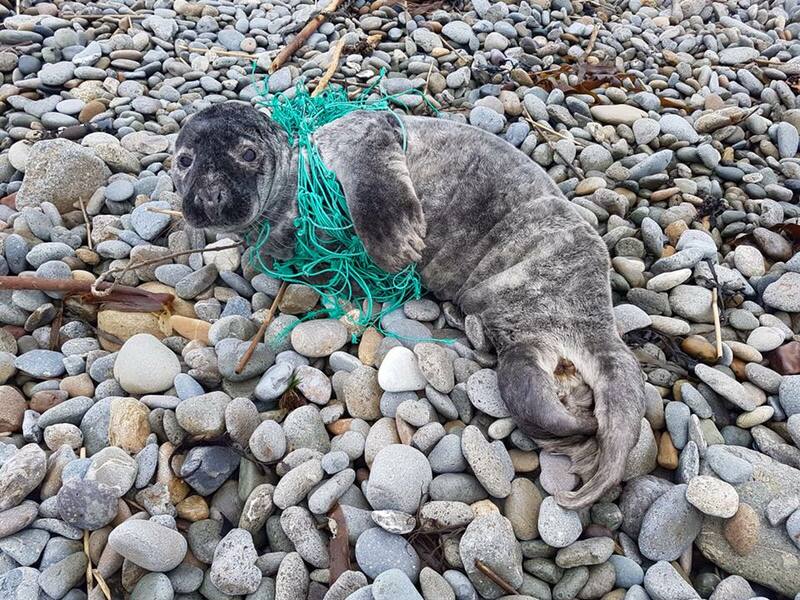 Tristan, a grey seal pup found on Annestown Beach in Waterford in December 2017, was found entangled in a “ghost net” – an old fishing net that was lost or left in the sea. Fortunately we caught him in time and the net hadn’t yet become embedded in his skin. This meant we were able to simply cut it away from his neck. Earlier in 2017, another young seal named Merida came to us with monofilament fishing line wrapped around her neck. As she grew, the line had cut into her blubber and flesh, causing deep wounds. The line caused enough pressure on her head to push her eye out of its socket, meaning that by the time we caught her, her eyeball had to be removed. Luckily seals don’t rely on their eyesight to hunt, using their whiskers to detect vibrations in the water to find fish instead, and Merida made a full recovery. Even more recently, just last month we rescued a grey seal pup, Maui, from the Saltee islands in Kilmore, Co Wexford. He had a net tightly dug into his neck when he was found, but is making a good recovery now it has been removed. All these seals were lucky – seals who become entangled and are not found can easily die from starvation or suffocation, or from contracting infections in the wounds caused by plastic cutting into their skin. It is not always possible for us to rescue every seal with entanglement issues (they are too big to safely handle, they are impossible to get to etc) and the sad reality is that seals and other marine animals die every day because of waste in the ocean. As the leading producer of plastic waste in the European Union, Ireland has a huge role to play in resolving this problem. By reducing our plastic use and reusing and recycling used items, we are doing our bit to protect seals and other marine life from ending up in a situation like Tristan and Merida were in – or worse. For information on what to do if you come across a seal that is entangled, click here. If you would like to find a creative way to deal with your plastic waste, you can read our blog post about ecobricks here. Unfortunately, by the time we received the call it was too late for a boat to return to the island. This is the part that can make trying to arrange a seal rescue so stressful. Often a seal is not in a convenient location (such as on an island), or our seal rescue network volunteers are not available at the time. It can be the most humbling and devastating feeling to know that there is a seal in distress but be unable to get to it, and this was the predicament which faced us that Thursday evening. We made contact with Declan Bates who runs the ferry to the Saltee Islands, and tried reaching numerous other volunteers, working into the night to try to find a solution for the pup. When Friday dawned stormy and rainy, the prospects were very grim. The water between Kilmore Quay and the Saltee Islands is notoriously dangerous even on a pleasant day, and so we had to wait another day. Fortunately, Saturday turned out to be a beautiful day. Having reserved space on the ferry, two of our resident volunteers Gale and Katy headed off. When they landed on the rocky shore of Great Saltee Island, Declan pointed out where our initial caller had spotted the seal last. However, once they left the small strip of sand where Declan dropped them, the terrain quickly became difficult to traverse. Many of the rocks were covered in kelp which made them extremely slippery and difficult to maneuver. This particular shoreline was probably the hardest place to spot a seal as not only did the rocks look somewhat like seals from far away, but were configured in such a way that you could only see between them from certain angles. Finally, after searching for awhile they noticed a different texture, followed by faint movement, and were relieved to have found the seal! However, on closer inspection the pup revealed itself to be perfectly healthy, and so they moved on. Gale and Katy went on to find an entire colony of grey seals, but after observing through binoculars they established that none of them had anything wrapped around their necks, and began to feel a little worried they were too late to help the injured seal. Our volunteer Katy described her feelings when they headed back towards the boat without finding the entangled seal. “By the time we made it within view of the sandy landing strip I was feeling thoroughly defeated. I was thinking that we had already used up two of the four hours we had, and even if we found the seal soon it was bound to take a long time to capture and carry it back to where we would be leaving from. However, within moments my hopelessness turned to disbelief as who should appear on the exact stretch of sand that we had arrived on but a seal, with a very obvious entanglement around its neck! Since the seal was still quite close to the water, it was going to be tricky to get him without frightening him away. Luckily our volunteer Gale has extensive experience capturing anything from common seals to huge adult sea lions, as she used to volunteer at the Marine Mammal Centre in San Francisco. With extreme caution, she began to painstakingly sneak up on the seal, trying to situate herself in the small area between the seal and the water. Katy, observing from a safe distance, described her approach as "almost comical as she walked doubled over only a few steps at a time, then crouched down and stayed still when the seal looked at her. Only when it resumed scratching itself would she dare to take a few more steps". Once she was close enough, Gale stepped swiftly behind the seal, unrolling a towel to create a barrier between the pup and the water. Katy then hurried down to them as the seal snarled at this sudden threat. Using another towel, Katy safely restrained the seal (Serious warning: please do not try this yourself! Seals have a nasty bite and should only be caught by trained volunteers. Call us if you find a seal in need of help.). After allowing the seal to calm down, Gale gave it some subcutaneous fluids from the drip set to make sure that it was thoroughly hydrated for the return journey. They covered the cage with blankets, and poured seawater over it to keep it cool in the sun. Transitioning the cage onto the boat was challenging, but thankfully, the other ferry passengers were eager to help! On arrival back to the mainland they took the seal directly to Gorey Veterinary Practice, so the net could be removed right away. The wonderful Dr. Vaughan, (who comes every few weeks to give her professional opinion on our seals) sedated the seal and then cut away the netting. Thankfully, it had not yet cut into the muscle which means a faster recovery. She cleaned the wound and we returned to our Courtown Seal Rescue Centre to settle the new arrival in. Later that evening we decided to name him Maui, for the demi-god in the Disney movie Moana. Maui has been making steady progress since he arrived. Within days he was eating fish on his own and the fluid retention in his head and neck has gone down significantly with the removal of the entanglement. Maui is up for adoption to the public, meaning that with a €30-35 donation you can receive updates on his progress and get invited to his release. It is very important not to forget how lucky Maui is. If the finder had not spotted him and notified us of him quickly, or if the weather had not been good for the boat to cross then his story could have turned out very differently. Entanglement is a huge and growing threat facing marine life, but it is also a threat that everybody can help to minimize. Protecting our oceans can be as simple as refusing to buy products which have a lot of plastic on them or recycling whenever possible. You can also help us by providing services (like the wonderful Declan Bates and his boat) or by becoming a member of our Seal Rescue Netwotk. We have regular training and recruiting sessions around the country, so keep an eye on our Facebook page to see if there is an event near you soon. Things are a little quieter since we released the last 7 seals… literally, Grey seals are really noisy!!! In ICU we are still reeling since the very early arrival of Baby Noodles…. He is the definition of cuteness, and a shock to the system after a tough winter with big angry greys. Noodles is docile and sweet and his quiet cooing melts our hearts. He is getting stronger by the day, gaining weight and loving his baths… he is starting to moult his lanugo coat as well to reveal his spots below! Maui and Wednesday are in Kennels. Wednesday still has a persistent ear infection and is back on different antibiotics to try and clear it up again. She remains feisty and playful and is thriving in all other respects and is very big now. She would be fit for release going by her weight but she's held back due to the infection. Poor Wednesday is frustrated being confined to the kennels, but we try to keep her as enriched as possible with feeds spread out, a full fresh bath, and different toys throughout the day. Hopefully the infection will clear up soon and she can return to the pools. Maui is amazing. His entanglement wound around his neck is healing nicely, and he has a good appetite allowing him to gain much needed weight. He is on antibiotics for the wound and a cough, but he remains feisty, bright and very alert and active! We can’t wait to get him into the pools and back to the wild as soon as we can! Merlin made his graduation to the Nursery Pool which is very exciting! We are all delighted to see him soooo happy – he’s loving the space and is spending all his time frolicking, splashing and playing with leaves in the pool. So so cute. He will need a short stay in here to get some exercise and get his fitness up in preparation for his release which will be really soon now. Yay! Falkor is in the Physio Pool on his own at the moment since the other seals were released. He has good use of his wonky flipper, and the wound is nearly completely healed up now meaning he is almost set for release in the coming weeks. Tauriel, Bran and Hansel are in the Rock Pool together and all still have the seal pox, but thankfully they are at the end stages of the virus now and the pox are clearing up which means they are also nearly ready to head home! Zoe, Ophelia and Fizzgig in are in the Pre-Release pool and are in great shape, they just need to gain a little more weight before they’ll be given the OK to be sent home. Common Pup Season 2018 Begins! Our first common seal pup of the season has arrived, and to kick off our new name theme of "Foods of the World", this little cutie has been dubbed "Noodles". Noodles was rescued on 20th May 2018... he is very early as normally we wouldn't start seeing common pups until June. He was only a day old and is premature still sporting his lanugo coat which is normally moulted prior to birth, and apart from a bit of mild congestion and the fact that he had been abandoned he is thankfully a strong pup and is doing well. Our managers Sam and Rhi and our interns are exhausted like new parents having to feed the baby around the clock! As he is so tiny and being premature he requires feeds every few hours night and day. But their effort has paid off as he is bright as a button and doing so well! We have started giving him short warm baths to clean him up each day which he absolutely loves. Another shout out to our supporters BRITA Ireland who we gave the privilege of naming our first summer pup (great choice with Noodles we must say) as they have not only sponsored one our pools for the year, but they have also offered to pay for our educational signage! So very generous, thank you! Noodles is still in one of our ICU boxes as he is very small and requires close monitoring as premi pups can often decline rapidly and have health issues due to their organs often not being fully developed. So visitors will not be able to see him yet until he grows a little bigger and stronger and is more able to regulate his own body temperature when he can move into a bigger kennel. Noodles is up for adoption though! Adoptees receive regular PUPdates and photos, and you will be directly helping Noodles through his rehabilitation!